Before we go to the next topic of the objectives of the logistics, it will do well to spend some time on the implications of GDP since it seems to reflect, suggest some vital aspects of daily living of the people, leave alone the economy of the nation; the fact of the economy of a nation largely remains more as a theory for majority of the people rather than a fact though his daily living is affected by the economy of the nation. 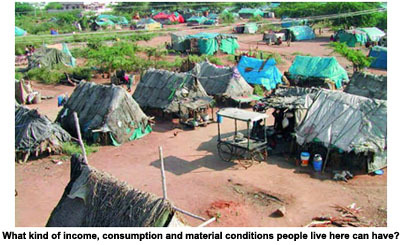 GDP reflects the daily living conditions of the people. The common living of the people is generally measured under three categories for the sake of convenience: income, consumption and material conditions. Let us look at these three facts briefly since they constitute actual daily living of any individual. Income means simply money received by an individual as salary, as wage, as returns from some investments which may be some mutual funds or some real estate, or farming; any engagement that brings money to the individual is income. Let us not go into the vast and complex area of taxable income. It is enough for the present that income refers to the money one individual gets from some activity. And this fact of income is most important because it actually impacts on all activities of living of any individual. When we say, money received is income, the next spontaneous question will be �How much�? It makes it clear that income is not equal to all and there are and must be inequality in the factor of income. Naturally, we have low income and high income. But one crucial fact must be mentioned here. The money one can afford to spend after paying due taxes to the government is one�s real income; it is generally called disposable income.� Whether one spends all disposable income or not� is a totally different question with which we are not directly concerned since the answer to the question shifts attention to so many other areas of living and concern. As of now, let us not drift into those areas of study. One thing: income is calculated for a given period. While computing GDP net national income and household disposable income are taken into account. Next is Consumption. To put it simply, it means using a product, a thing or a service. While being used, the product or the thing disappears or changes into something else. When you consume food, it is changed into some other thing. It involves therefore quantity and the time taken to consume it. Consumption is most vital toady for business and therefore for the economy of the nation. The more the money circulates, the greater the value is added to it. Of course, like income, consumption also reflects the rich or the poor condition of the people. Consumerism is a growing concern for the marketers since without consumption no business activity can thrive. There are theories of consumption with which we need not concern ourselves now since they fall outside the scope of the present context. The basic things involved in the act of consumption are price, quantity, and a third subtle fact is the tendency to save. We will take up the last fact, the materials conditions in our next session.